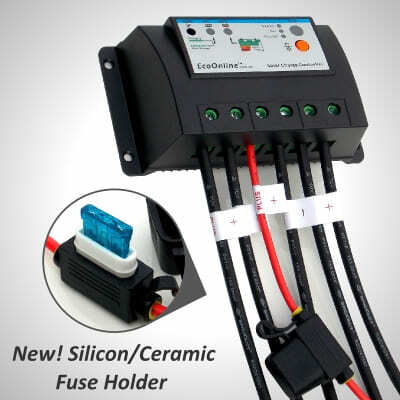 EcoOnline recommends solar panel wattages and connected loads should not exceed: 240W solar power (at STC for a 12V system) or 15Amp continuous load for the 20Amp regulator. This regulator is to be used for charging Sealed, Gelor Flooded Lead-Acid typebatteries only. Not to be used for charging any other battery chemistries. Always use appropriate gauge wires. Never exceed the rated Ampacity (amprating) of a wire. Keep in mind that low voltage / high current wires situated in highly insulated environments cannot dissipateheat and will have a much lower Ampacity. The appropriate fuse MUST be installed on the positive regulator to battery connection. Do not expose this regulator to water and/or highhumidity and/or corrosive environments such as those involving marine applications.